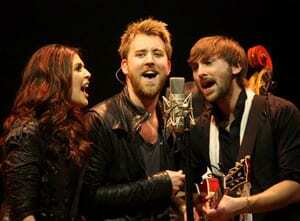 Lady Antebellum concluded its two-night stand at The Ryman Auditorium on Thursday (3/11) by demonstrating to a sold-out, A-List crowd that it is one terrific little party band. The set was peppered with bright, tightly harmonized rockers, including the concert opening “Stars Tonight” and such radio favorites as “Love Don’t Live Here Anymore,” “Looking for a Good Time” and “I Run to You.” One highlight was an acoustic arrangement of the Hank Williams classic “Lost Highway.” Another was, naturally, the gorgeous “Need You Now.” At many points, the audience sang along and/or took its own vocal solos. The evening began with a pre-show cocktail supper in the band’s honor staged by Adams & Reese LLP for its clients flown in from Baton Rouge, Birmingham, Houston, Jackson, Memphis, Mobile, New Orleans, Sarasota, St. Petersburg and Tampa. The soiree was notable for being the first event staged in Market Street Emporium, the space on 2nd Avenue formerly occupied by Windows on the Cumberland. The evening was so balmy that those namesake windows facing the river were open to let the breezes blow in. From there we strolled up the hill to the Ryman, pausing to peruse Trinkets & Treasures, the new Dolly Parton gift shop at 126 2nd Avenue North. The superstar had her ribbon cutting in the rain on Friday morning (3/12), complete with a Dolly look-alike contest. Once we reached our seats in the Ryman, we realized that this show was going to be a “perfect storm.” In addition to having thousands of rabid, screaming fans and two dynamite singer-songwriter opening acts, the joint was packed with Music Row’s finest – Paul Worley, Brent Rowan, Mike Dungan, Charlie Chase, Rivers Rutherford, Rod Essig, John Huie, Roy Wunsch & Mary Ann McCready, Steve & Ree Guyer Buchanan, Scott Stem, Lisa Konicki, Ron Huntsman…you get the idea. Lady A’s Hillary Scott introduced Randy Montana, noting that both are “second generation” country-music kids who attended school together. Her mom, Linda Davis, was in the balcony as was her musical entrepreneurial pop, Lang Scott. So was Randy’s dad Billy Montana. Lady A’s Charles Kelley and Dave Haywood have known each other since they were boys in Augusta, GA. Charles said they moved to Nashville because of his brother, Josh Kelley, who was the other opening act. Soulful Randy’s three-song set introduced his excellent new single, “Ain’t Much Left of Lovin’ You.” Strong-voiced Josh previewed a UMG album he is working on. After the concert, the party continued with a post-show reception at Cellar One, 172 2nd Avenue North. The brothers Kelley said that they planned on rocking the night away.